Comparing the various knitted letter contributions we’ve received so far, brings up the idea of understanding individual knitting methods as a kind of “handwriting”, in which the form is defined by the personal process. RS: For your letter contribution to “Schalalala” you chose a very twisty pattern, which perfectly fits your personal technique. 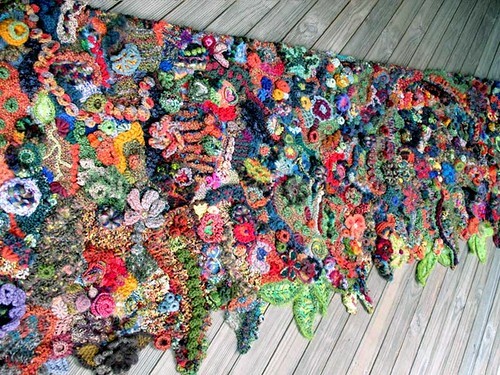 In “Freeform Knitting” you combine Crochet and Knitting in a very organic way. How did you develop this technique? 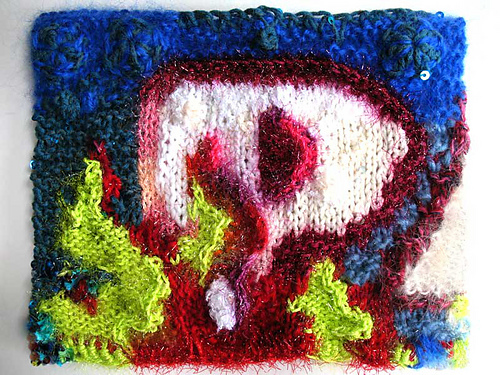 PM: I had been creating my own designs with intarsia knitting since the early 1980s, and I started adding crochet to my work in the 90s for a couple of reasons. I had knitted so much, and for so many years, that I was starting to experience pain whenever I overdid it. I found that combining knit and crochet together helped, as it gave me a wider range of hand movements. It also helped to create more unusual textures, and therefore gave a more tactile quality, to the fabrics I was creating. RS: Your works remind me of strangely grown plants, or underwater animals. “The evolution of the scrumble”, a step-by-step documentation of your knitting shown on your homepage, even reminds me of the emergence of city structures, over hundreds of years. Do you experience your knitting as a chaotic process, or are there certain reccurent rules? PM: My designs are very rarely pre-planned. Most times I just start by choosing a colour scheme and collecting a lot of yarns that fit into that range, and then the works tend to develop organically from there. I do have favourite colours, and also favourite stitches, and sometimes I decide that a piece will be predominantly knit or predominantly crochet. RS: Some of your knitted wallhangings even resemble freestyle graffiti. Have you used Freeform Knitting for other (typo-)graphic or figurative motivs before? PM: I knitted a lot of one-of-a-kind ‘picture’ sweaters and coats when I first discovered intarsia knitting back in the ‘70s. I would lightly sketch an image onto graph paper, and then square up the graph as I knitted, often changing and adding to the design as I worked. RS: Have there been any other major inspirations from other fields, for example biology or architechture? PM: By osmosis I’m sure that a lot of interesting shapes and patterns, both from the natural and the built world, have seeped into my brain…but I don’t consciously seek inspiration for my designs from any particular sources. RS: On your blog you publish “A Scrumble a Week”, small patch ensembles that show Freeform Knitting in a micro scale. Is there a story to each of these scrumbles? Do you remember when and where you made them? PM: I have always travelled a lot, and over the years I have collected yarns from many different parts of the world. I tend to remember exactly where and when I bought most of the yarns in my stash, even those that were purchased many years ago or are left over from much earlier knitting. So all sorts of events, stories, times and places keep running through my mind as I work on each scrumble. RS: How does the Internet, or a tool like a Weblog, affect your knitting practice? How does it compare to, or interplay with other situations you work in, like workshops, or knitting on by yourself? PM: I have knitted since I was a small child, and I now belong to a number of (interstate and overseas) knitting and crochet guilds, and I now also teach a lot of workshops…but without the internet I feel that I still would have been working in relative isolation. I have lived in the sub-tropics for almost 30 years, and I didn’t run into a lot of other knitters or crocheters when I first moved here…but the internet and groups like Ravelry have definitely changed that. If it hadn’t been for the internet I’m sure my reputation wouldn’t have spread outside my own city; then I never would have had the chance to teach all around the world, or to discover and meet up with so many other creative fibre artists outside of my own local community.